Basic and advanced farm setups. Materials, herbs, fish and bait farming. Farming is an essential part of the gameplay. Most of the resources in the game are generated naturally in certain conditions. But sometimes it’s necessary to have a place where you can farm them in the required amounts. Output: unlimited water, honey, lava, Obsidian, Honey&Crispy Honey blocks. Decent starting amount of liquids. Timer or any type of engine. Background walls to prevent mobs from spawning and for additional lighting. A Bucket is used to carry liquids (water, lava, or honey). Recipe: 1 Bucket = 3 any Iron Bars at any Anvil. Inlet/Outlet Pump – used to transport Liquids, without having to construct pathways through Blocks, or rely on gravity. Recipe: 1 Pump = 10 any Iron Bars + 2 Wire at any Anvil. Recipe: 1 Timer = any Gold Watch + 1 Wire at any Anvil. 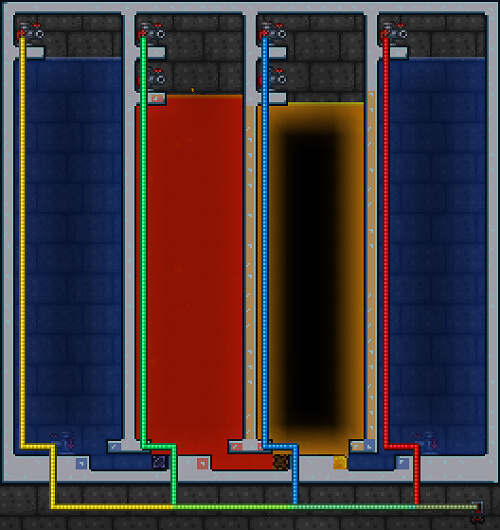 The Liquid Generator exploits a minor glitch that causes the outlet Pumps to create more liquid than the matching inlet Pump removes, therefore increasing the amount of liquid. Turn timer on to refill tanks. Collect the liquid and/or materials (Obsidian, Honey x Crispy Honey blocks). High material costs. Use Spelunker potion (and Metal Detector) to find Iron Ore. Another good way to obtain Ores and Bars is opening Crates. 1 block of jungle grass (jungle grass seeds+mud block). Jungle Grass Seeds can be found by cutting down plants growing on Jungle grass in Jungles using any tool or weapon. You can use existing jungle grass block. Flower Boots can occasionally be found in Jungle Shrine chests or Living Mahogany Tree chests. The Bug Net is purchased from the Merchant for 25 Silver Coin each. The Flare Gun is found randomly in Gold Chests underground. Flares are used as ammunition for the Flare Gun. They can be purchased from the Merchant for 7 Copper Coin each, while a Flare Gun is in the player’s inventory. The Sickle is purchased from the Merchant for 60 Silver Coin each. The only difficulty of making this farm is to find Flower Boots. Use Metal Detector and Spelunker potion. Basic setup is a rectangle room 2 tiles wide and 3 tiles tall with at least one tile of jungle grass underneath. Flower Boots cause flowers to grow when the player walks on Grass. Flowers can be broken to spawn Seeds and Bait creatures, as well as harvested with a Sickle to produce Hay. Flares stick to the blocks they hit and constantly deal minimal damage destroying the flowers. Fire a flare at the jungle grass blocks. Stand on the jungle grass blocks wearing Flower Boots. Swing the Bug Net to collect bait. The farm can be runned full-auto using default windows ClickLock feature or any external analog. Corresponding growing surface (seeds+dirt; sand, snow). Background walls to prevent mobs from spawning. Grass Seeds are purchased from the Dryad for 20 Copper Coin each. Jungle Grass Seeds can be found by cutting down plants growing on Jungle grass in Jungles using any tool or weapon. Crimson/Corrupt Seeds can only be obtained in a Crimson/Corruption world, either as a drop from the Eye of Cthulhu or purchased from the Dryad for 5 Silver Coin each, during a Blood Moon. Hallowed Seeds are purchased from the Dryad for 20 Silver Coin each, during hardmode. Acorns are randomly dropped when cutting down trees, and can also be purchased from the Dryad for 10 Copper Coin. Basic layout is a growing surface 3 tiles wide and 16 tiles of vertical clearance for most of the trees (24 and 30 tiles of vertical clearance for Jungle trees and Palm trees respectively). At least one tile of empty space straight behind the sapling if using background walls. WARNING Ensure that hallow, corruption, and crimson cannot spread. In this example sand>jungle grass (immune to hallow) > hallow (blocked by corruption/crimson) > corruption/crimson (blocked by hallow) > snow (immune to everything) > grass. Wait for saplings to grow into trees. Collect wood and replant acorns. 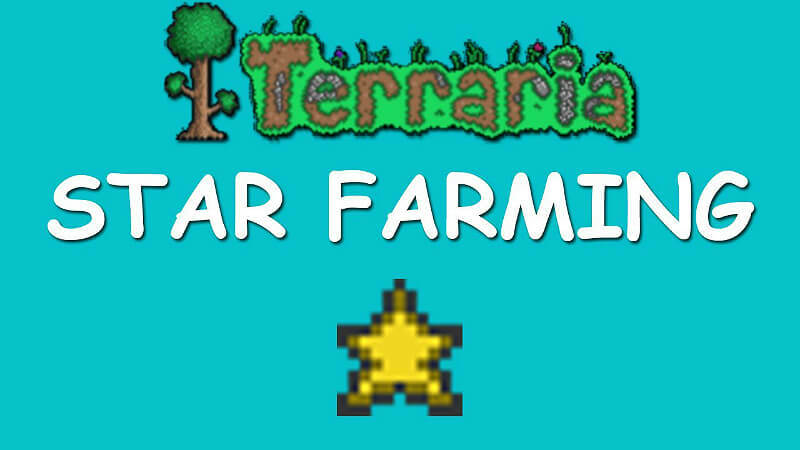 Built farm can be easily expanded by adding more levels. Type: pre-hadmode/hardmode(fireblossom planer box), manual. Staff of Regrowth (strongly recommended). A row of grass for growing Pumpkin. Planter Boxes are purchased from the Dryad for 1 Silver Coin each. Any planter box can be used to grow any herbs. The Dryad starts selling planter boxes after defeating any prehardmode boss. Deathweed-corrupt/crimson grass, ebonstone/crimstone, blood moon/full moon; Fireblossom-ash, 3:45 pm to 7:30 pm, if not raining; Moonglow-jungle grass, night; Waterleaf-sand, rain; Shiverthorn-snow, anytime). Pumpkin Seeds are purchased from the Dryad for 2 Silver Coin 50 Copper Coin each. The Staff of Regrowth is a unique planting tool that can be found in Jungle Shrines, and Jungle Crates from fishing. It increases the yield of herbs and seeds when harvested. When used on Dirt blocks, grass will be planted without the need for seeds. Basic setup is a row of planter boxes with at least one tile of vertical clearance. Pumpkins require 2×2 tiles of empty space. Wait for sprout to grow into mature herbs. Wait until bloom to acquire seeds. The farm can be easily expanded. Max efficiency when using Staff of Regrowth. It will take some time to find needed seeds and sow all growing areas. Required: sand, sand laying surface. Basic layout is a long row of sand with 7 tiles of vertical clearance. Actuator is a mechanism item purchased from the Mechanic for 10 Silver Coin each. When activated, the tile it sits on toggles between active and inactive state. Wire is available for purchase from the Mechanic for 5 Silver Coin each, but can also be obtained from naturally-occurring mechanisms. 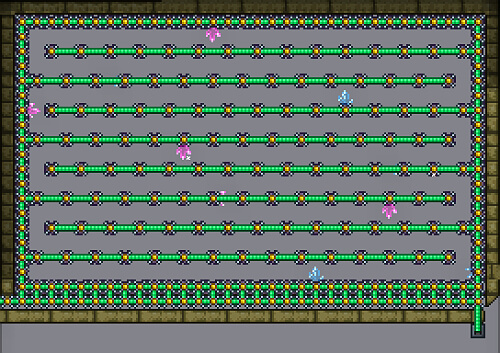 Conveyor Belt (Clockwise & Counter Clockwise) is a Hardmode block that is purchased from the Steampunker for 5 Silver Coin. It can move NPCs, items, and players. (Or any other activation mechanism) Lever is purchased from the Mechanic for 30 Silver Coin. Wait for cacti to grow. Collect manually or using auto setup. Mushroom Grass Seeds are a type of Seed that has a chance to drop from harvesting Glowing Mushrooms. The seeds can also be purchased from the Dryad for 1 Silver Coin 50 Copper Coin each, while the Dryad is living in a mushroom biome. Dart Traps are found naturally placed in random areas on the Cavern layer, and more frequently in the Dungeon. The Switch is an activation mechanism purchased from the Mechanic for 20 Silver Coin. It can also be found in the Dungeon. Basic layout is a row of growing surface with at least 1 tile of empty space. Mushrooms will not grow if there is a player-placed wall behind them (except Glowing Mushrooms). Mushrooms will not replace grass. Corresponding surface switches (top 3), multisurface switch (bottom). Wait for mushrooms to grow. Let mushrooms fall on the hook track. Mushrooms and Vile/Vicious mushrooms should be collected regularly to reach max efficiency. Difficult to build and expand. Required: water, sand, sand laying surface, Ocean biome. Optional: partial automation tools, background walls to prevent mobs from spawning. Basic layout is a long row of sand with at least 5 tiles of water above. Growing surface must be positioned within Ocean biome (250 tiles from the edge of the map for small worlds). Use Pumps or Bottomless Water Bucket to fill farming area with water. Bottomless Water Bucket is one of the possible rewards from the Angler upon completing one of his fishing quests in Hardmode, with about a 1/70 chance of obtaining it. Minecart Track with a bumper end. Recipe: 50 Minecart Tracks = 1 any Iron Bar + 1 any Wood at any Anvil. Teleporter is a travel mechanism purchased from the Steampunker for 2 Gold Coin 50 Silver Coin. Any type of player triggered Pressure plates can be used. Pressure Plates can be purchased from a Mechanic for 50 Silver Coins each. Wait for coral to grow. Moving big amounts of water required. Required: any blocks, any Hammer. Basic layout is a long row of blocks with 2 symmetrical hoik tracks on the top. To reach max efficiency this layout should be as long as possible (up to the ends of the map). Recommended level – Space, over the floating islands. Create a row of blocks 2 tiles high. Use any Hammer to make hoik tracks. Make an exit hole near the spawn point or your house. Start moving from this position to the sides (this will allow you to start collecting some percentage of fallen stars immediately). Fallen stars are the only drops in the game able(due to their speed) to enter hoik tracks by themselves. Type: hardmode, pre-Planterra pickaxe needed. Required: chlorophyte ore, mud, Underground level or below. Optional: background walls to prevent mobs from spawning and for additional lighting, any mount. Chlorophyte Ore is a Hardmode ore found in the Underground Jungle that is used to craft Chlorophyte Bars. 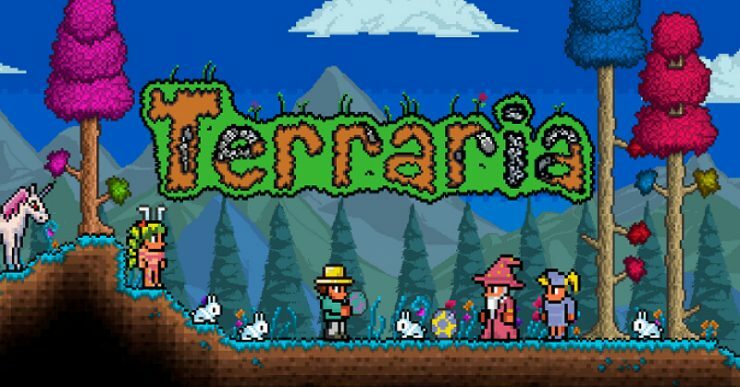 When Hardmode starts, Mud and Jungle Grass located in the Underground Jungle will begin to convert into Chlorophyte Ore. A Pickaxe or Drill with at least 200% pickaxe power is required to mine it. Chlorophyte Ore will spread itself by converting nearby Mud and Jungle Grass blocks into more Chlorophyte Ore. Basic layout is a 40 blocks of mud and at least 1 chlorophyte ore inside. At least 38 tiles of horizontal and vertical space(no chlorophyte ore) required. This example created 4 tiles tall to collect grown ore riding mount. Place chlorophyte ore “seed” in the center(recommended) of mud rectangle. Wait for chlorophyte to grow. Restoring growing areas takes time. 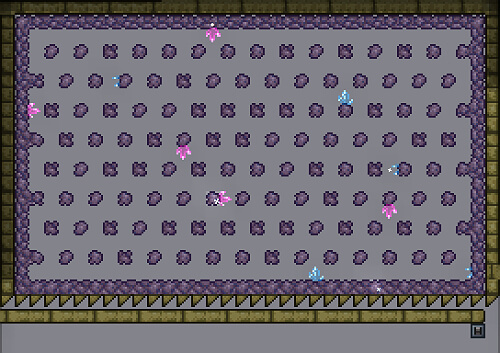 Required: pearlstone blocks, Caverns level or below, Actuators, Wire, Switch. Optional: background walls to prevent mobs from spawning and for additional lighting. Wait for crystal shards to grow. Let crystal shards fall on the hoik track. Required: correspondent biome blocks, water, lava, honey. The Gif is a general example. Special conditions listed below. 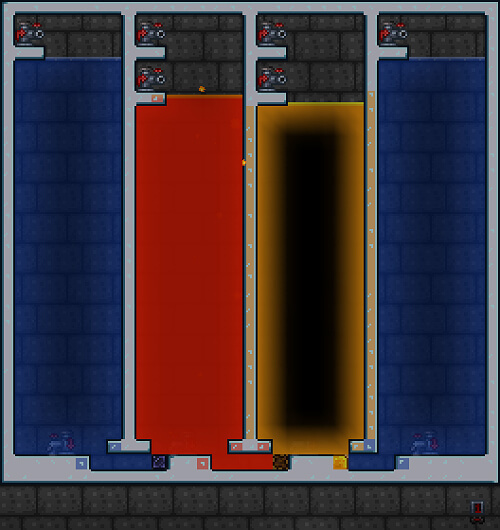 Required Volume(no penalty) – 300 tiles for Water and Lava, 200 for Honey. Forest(the Purity)(Surface and Caverns level) – when none of the other conditions for a biome are currently fulfilled on the surface, then it is a forest biome. Ocean(Surface level) – 1000 tiles of water. Hallow(Surface and Underground level) – at least 100 Hallowed Grass, Pink Ice Block, Pearlstone, and Pearlsand defines the Hallow. 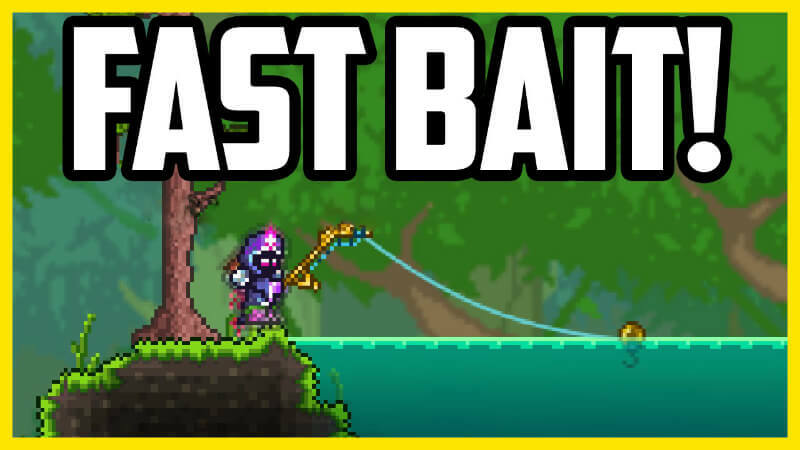 Hallow biome fish can be caught pre-hardmode. Corruption/Crimson (Surface and Underground level) – At least 200 Corrupt/Crimson Grass, Purple/Red Ice Block, Ebonstone/Crimstone, and Ebonsand/Crimsand defines the Corruption/Crimson. Snow Biome (Surface and Underground level) – a Snow biome is defined by the presence of 300 or more Snow Blocks, Ice Blocks (including pink, purple, and red variants) or Snow Bricks. Jungle (Surface and Underground level) – at least 80 blocks of Jungle Grass defines Jungle. Mushroom Biome (Any level) – at least 100 tiles of mushrooms or mushroom grass defines Mushroom Biome. Do not place fishing ponds too close to each other to avoid biome overlapping. In adition you can connect fishing ponds using teleporters. Can be built almost anywhere.